Landscape plants are a great investment to a property and often easily maintained, but sometimes our plants suddenly stop thriving or die off. Why is that? There are many factors that can cause a decline in plants, whether it’s from disease, insects, a problem in the roots, something internal, structurally or the plant can just be in the wrong location. 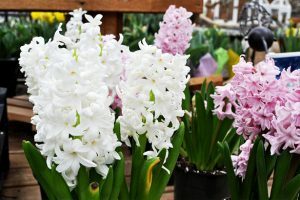 That’s why it is vital to pick the healthiest plants from a reputable nursery to start with and to know the attributes of the plants you want in your landscape. This is particularly important because landscapes are often planted for aesthetics and not with the overall health of the plant in mind. First, to match your plant material to the planting site you must determine the soil type. Most of the soil in New Jersey is clay and shale based. This type of soil may be good for some plants and not for others because it is often compacted. Compacted soil can lead to water not reaching the roots of the plants and can cause a drainage issue. It is best to survey the site beforehand and know where the water sits and drains. This is particularly important because some plants like moist soil and some do not. For example, White Pines do not like wet soil, they decline very rapidly in wet waterlogged areas. You wouldn’t want to plant White Pines in a detention basin because of how wet it stays all the time. Organic-rich soil may be added to the planting areas to improve the drainage and soil conditions. You may need a professional to help with site drainage before moving on. A soil test from a laboratory is also beneficial as it informs you about the nutrients that are either lacking or in abundance in your soil. It also informs you what the pH of the soil is. Certain plants thrive in more acidic soil, while other plants like more alkaline soil. Knowing the pH helps you select the right plants for your soil type. You wouldn’t want to pick two different plants that like different soil pH’s and plant them next to each other, one would do very well and the other might suffer. Another factor when planting landscape plants to address is how much root space and overall space in general there is at the site. If this landscape is next to a house or building, you shouldn’t pick a tree that grows too large or wide for the area you have available. For example, someone plants a blue spruce next to the front corner of their house. It was small and looked great when it was planted but, fast forward 15 to 20 years later and that same tree is now taller than the house and growing into the siding. Not only did it outlive the space, but the roots can also cause damage to sidewalks, driveways, utilities above or below ground and even the foundation of a house. Think about the trees in New York City planted in soil in the middle of a sidewalk; with no space for the roots to grow, eventually the trees die off. Too often we see on the news after a particularly bad thunderstorm, a tree or tree branch that has fallen onto a house or car. It’s best to pick plants that have space to grow but not get too large as they often can overtake the entire space and/or be a danger to life and property. Next, we recommend determining the amount of sunlight each area of your landscape receives. Based on shade and sunlight availability, picking a suitable plant for that area is highly encouraged. Check the tags of the plants when purchasing them to determine the amount of sunlight each species of plant requires. The tags on the plants contain vital information relating to best watering practices and how much sunlight the plant requires. Some plants require partial shade, or full sun all day. Different problems can arise in a plant being in too much sunlight if it requires more shade or vice versa. 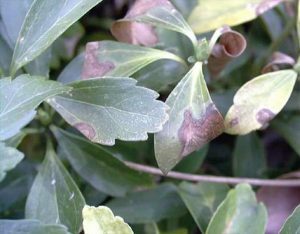 A plant such as an azalea can have more lacebug problems in full sun than in partial shade. That’s not to say that the azalea in partial shade never has a lacebug problem, but it being in the proper place helps reduce the issue if the plant is in the right location. 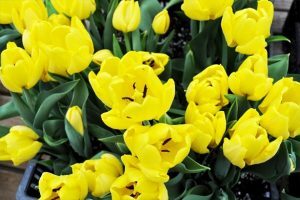 Spring and fall are the traditional times for planting, but modern methods and tools have made it so that you can plant all year long if the soil has not yet frozen. 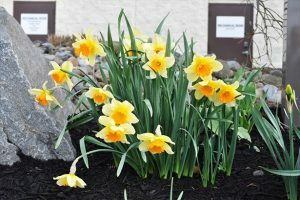 The plants you or your landscaper pick should be installed at a time of year that is ideal for that plant and other environmental stresses are low. The point being, picking the best time of year for the specific plants, with limited stress, is the best option for your new plants. Almost all landscapes contain either mulch or stones/rocks. Mulch is very beneficial to the landscape, as the mulch decomposes it adds vital nutrients back into the soil. The plants use those nutrients for growth. It is best to use only 1- 3 inches of mulch and keep the root flares of the plants exposed. Trees produce oxygen from the roots, if the mulch is piled too high it basically suffocates the tree or shrub. It can also trap moisture against the bark, causing it to rot. 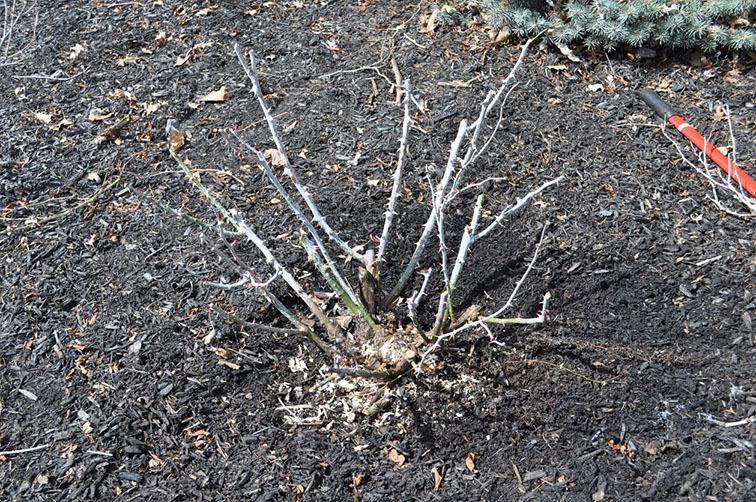 This causes damage and decline of the tree or shrub over time. Mulch also helps reduce weed growth throughout the season. 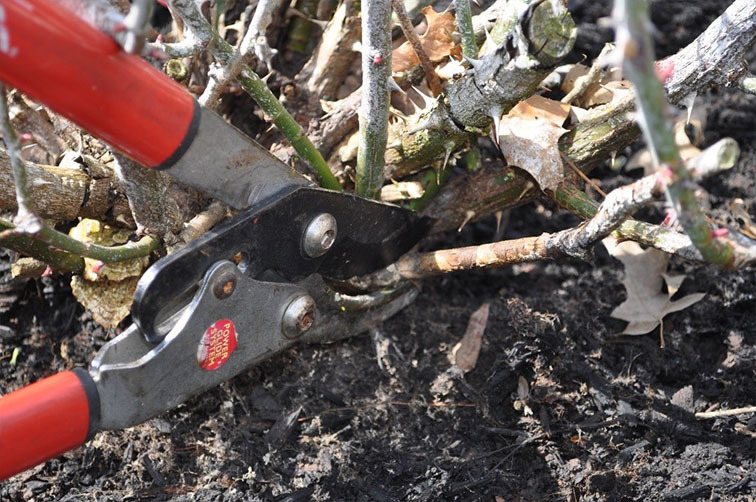 For more information on proper mulching techniques, click here for our mulching blog. 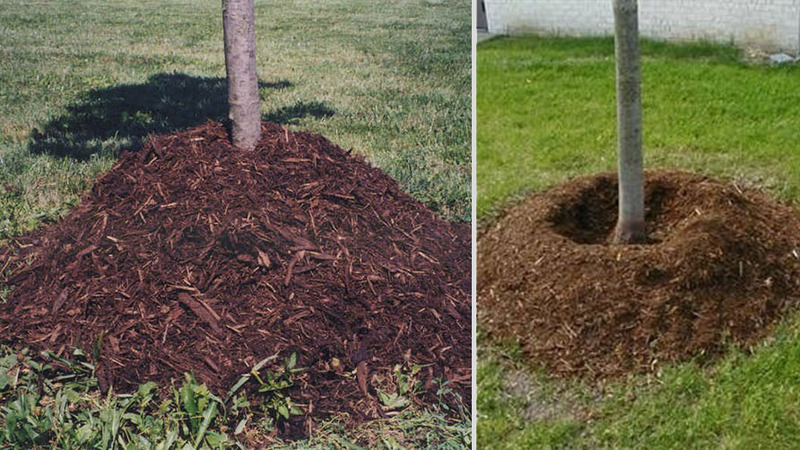 The picture on the left shows a tree planted with too much mulch. The picture on the right demonstrates a newly planted tree correctly mulched. There are many factors that go into choosing and planting a landscape for a homeowner. 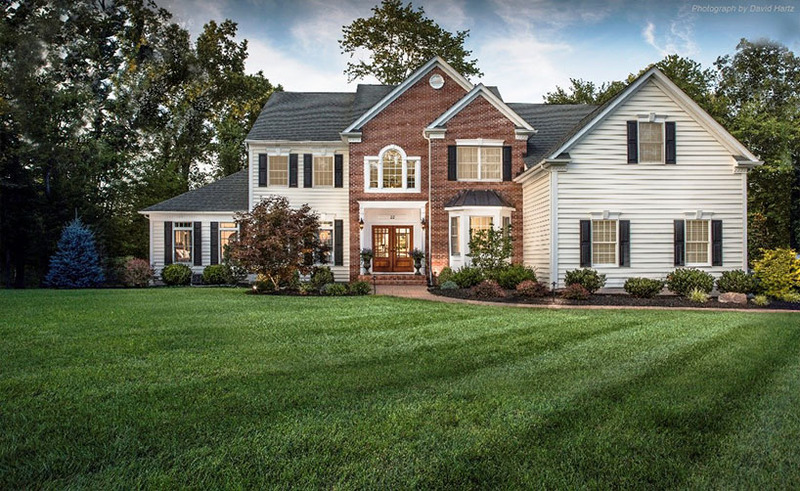 Whether you plan on doing it yourself, or you hire a landscaper, consider the various factors that can greatly impact the health of your new landscape. Soil type, sunlight, watering practices, root space all greatly affect the livelihood of a plant. 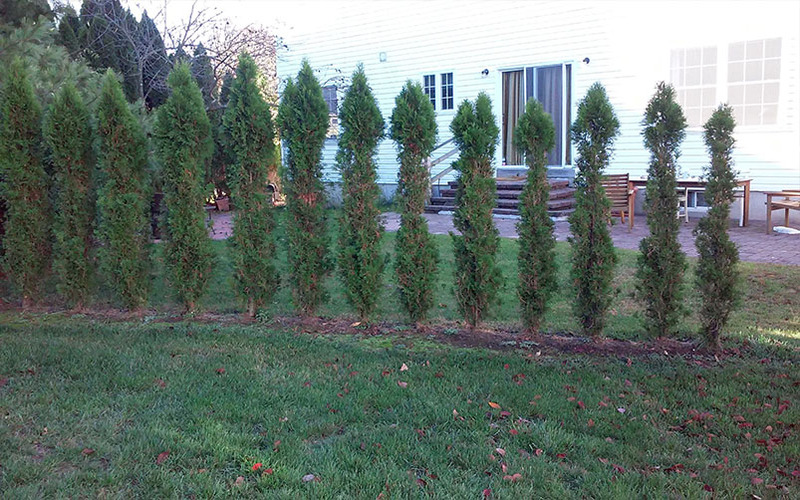 If you are in our service area and are planning on installing new landscape plants and have questions, please give our office a call at 908-281-7888. Photo provided by Dr. Richard J. Buckley, Director of Plant Diagnostic Laboratory, Rutgers. Look out Emerald Ash Borer, there’s a new invasive species taking over the headlines. The Spotted Lanternfly was first discovered in Berks County, Pennsylvania in 2014 and slowly spread into surrounding areas. 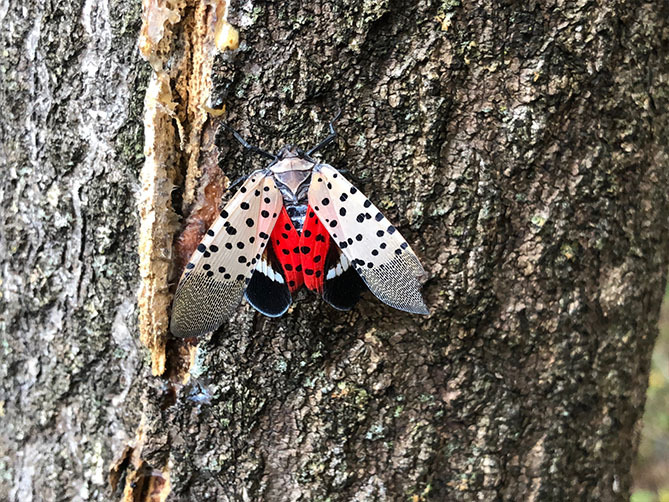 Unfortunately for New Jersey residents, the spotted lanternfly was confirmed in Warren County during the summer of 2018 and also confirmed in other counties later that same year. The spotted lanternfly is native to Asia and it’s believed to have landed in Pennsylvania on a shipment of stone that contained an egg mass. They lay eggs in masses on any type of flat surface; this includes tree trunks, rocks, furniture and equipment left outside. The egg masses look very similar to dried up mud making them very easy to overlook. Fortunately, they only have one generation per year and adults will typically lay eggs between August and December. The nymphs hatch in the spring and are black with white spots in the beginning stages. As the nymphs get to the fourth and final instar stage, they will get red coloration on their body before maturing into adults. You can find the spotted lanternfly adults between July and December. What does the Spotted Lanternfly Affect? Unlike the Emerald Ash Borer that targets ash trees, the spotted lanternfly has a large range of plants that can be used as suitable hosts. The preferred host in our area is the Tree of Heaven, but the biggest concern is the potential impact on fruit trees and crops. The spotted lanternfly can feed in large numbers, impacting the overall health of the plant resulting in lower yields. The insect has been found on apple and peach trees in Pennsylvania and is a major concern for vineyards. Vineyards have already noticed lower yields on their grapes due to damage from spotted lanternflies. They have also been observed feeding on hops, walnuts and hardwood trees. The spotted lanternfly doesn’t feed directly on the fruit or leaves, but rather it pierces through the bark or trunk of trees and feeds on the phloem. Because they can feed in such large numbers, this weakens and impacts the long-term health of the plant. As the insects feed on the phloem, they excrete a large quantity of honey dew which drips down the trunk of the tree, onto leaves, and potentially onto fruit. Any areas of the plant that have honeydew built up will start to get dark in color; this is because honeydew is an excellent food source for sooty mold fungus. Sooty mold fungus on leaves hinders photosynthesis and weakens the plant. For winemakers, most vineyards do not use the grapes once they are covered in a certain amount of sooty mold fungus. So what can be done? For most harmful insects, natural predators play a key role in keeping everything in balance. Unfortunately, with this invasive species, their natural predators are not here to help us control the population, so we need to find other control methods. First step is to make sure we are not actively transporting and spreading the insect. If you have traveled to areas that have known spotted lanternfly populations (Southeast Pennsylvania, Warren, Mercer or Hunterdon Counties in New Jersey), check your vehicle to make sure they are not on your car. The insects are known to be excellent hitchhikers. In the fall, check your vehicles for egg masses, it is very easy to confuse them for mud so take a closer look just to be sure. If you have any of their preferred host plants in your landscape, primarily the Tree of Heaven, see if you can locate any egg masses and scrape them off the tree, killing the eggs. Another option is removing any Tree of Heaven plants you have in your landscape completely. If you’ve gone through the steps and still have adult spotted lanternflies on your property, chemical control is another option. Using a product that has a good residual activity is preferred in case more adults visit the site after the initial treatment. If you live in our service area and think you have spotted lanternflies on your property, please give us a call or report it to the New Jersey Department of Agriculture. 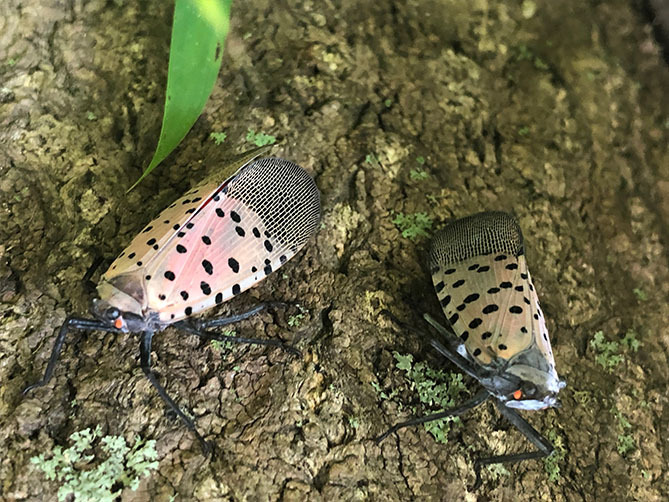 You can email pictures of suspect insects to SLF-plantindustry@ag.nj.gov or call the New Jersey Spotted Lanternfly Hotline at 1-833-223-2840 (BAD-BUG-0) and leave a message detailing your sighting and contact information. As spring approaches, we begin to think about getting out of the house and spending time outdoors. Whether it is in the garden, planting flowers or sitting back on the patio or deck relaxing, the one thing we do not look forward to is pulling weeds. A good way to free up your valuable time and keep weeds at bay is to apply a preventative weed control in your landscape beds before weeds begin to grow. 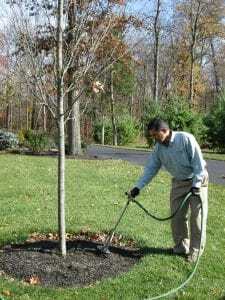 A pre-emergent broadleaf weed control or a preventative weed control is a material applied to mulch and/or landscape stone to suppress weed growth. Applications are best when done in the spring before weed seeds in the soil germinate and start to grow. Properly timed treatments will save you countless hours of pulling weeds or a great deal of money by not having to pay your landscaper to do it. Preventative weed control works by creating a barrier on your mulch, stone, soil, etc., and when weeds germinate and grow roots, the roots then come in contact with the barrier. The preventative weed control then stops the growth of the weed. These materials are not perfect and don’t prevent every type of weed, but they will make a significant difference in your landscape when applied correctly. There are a wide variety of preventative weed controls available at your local garden center or box store. Preen is a popular granular material that is easily spread in your landscape beds. 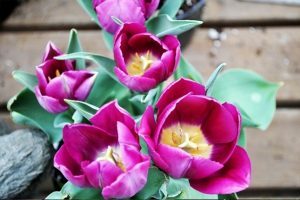 When purchasing a pre-emergent weed control, it is recommended to check the product label and use a material that does not prevent the growth of perennial plants like tulips, daffodils, and day lilies. Also, when reading the product label, ensure that the product is designed for use in landscape beds and does not adversely affect your ornamental trees and/or shrubs. Pre-emergent weed control for landscape beds can go on mulch, wood chips, shredded rubber mulch, rocks, stone type areas and soil. However, the effectiveness of the application varies greatly depending on what is treated. The level of control is significantly better on mulch or a small landscape stone than on bare soil. The treatment of pre-emergent weed control on bare soil provides short-term control and might require several applications a year. Therefore, it is recommended to mulch bare soil prior to applying your pre-emergent broad leaf weed control treatments. The above images show the pre-emergent weed control applied in a shrub bed. Compared to a nickle, you can see just how small the product actually is. 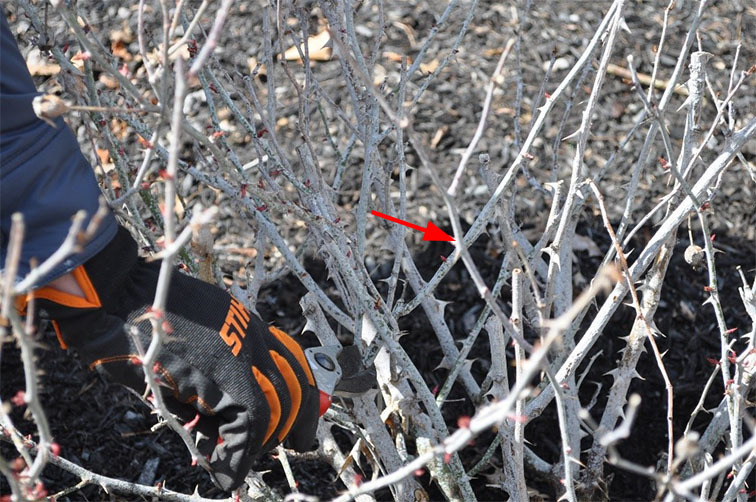 The above image is the same shrub bed with the pre-emergent weed control applied, from a distance. Weed growth on driveways, sidewalks and patios is best controlled with liquid post emergent weed controls, as granular preventative weed control products normally produce poor results in these locations. In part, this is due to these locations having high foot traffic. High traffic areas alter the breakdown of the material and the soil structure, if there is soil present in these areas. Another factor is that most granular materials are not fine enough to make its way down to the soils surface through the small space between your landscaper pavers and/or cracks in the sidewalk. In these cases, it is best to control weeds with a post emergent weed control. Beyond applying a pre-emergent broadleaf weed control on a yearly basis there are other things you can do to minimize weed growth in your landscape beds. Install breathable landscape fabric when new beds are created prior to applying your mulch or stone. Additionally, maintain a layer of approximately three inches of mulch in your landscape beds. We recommend using a quality mulch product, preferably shredded hardwood mulch. These types of mulch help suppress weed growth as well as regulate moisture and temperature levels in your landscape beds. Further, be cautious not to over mulch as too much mulch can be detrimental to the health of your landscape. Most importantly, do not hand pull weeds, as it is extremely difficult to remove the plant in its entirety. In most cases a portion of the plant or its root system will be left in the soil and simply regrow. It is best to treat weeds that breakthrough your barrier with a non-systemic post emergent liquid herbicide. 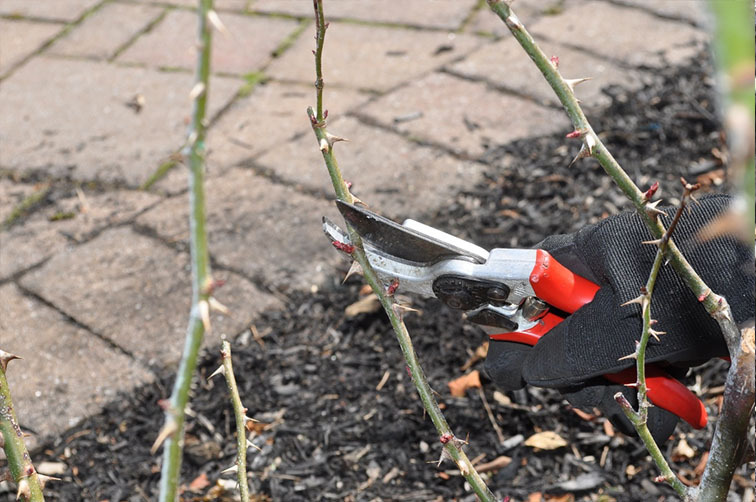 Instead of spending the season pulling those annoying weeds from your shrub beds, you may be interested in investing in preventative weed control for your shrub beds this springtime. If you are in our service area and have questions regarding pre-emergent weed control, please give our office a call at 908-281-7888 or request an estimate. In New Jersey, it’s almost certain that you will see deer on your property throughout the year. With large deer populations, damage to plants is significant and sometimes unavoidable for many homeowners in our area. Many homeowners strive to keep deer away from their landscapes, and we will go over some of the best ways to accomplish that. Most deer follow a similar movement pattern, meaning they travel from wherever they bed down for the night, to a food source and then back to their bedding area. Depending on their location and the time of year, common food sources may include acorns, farm crops, or your favorite landscape plants. Some common landscape plants they like to feed on are arborvitae, hollies and azalea to name a few. When times get tough for deer and food sources are limited, such as during the winter, even plants advertised as “deer resistant” may still have damage from feeding deer. Deer feeding may cause permanent damage on some plants, ultimately causing death, however, most times the damage just looks unsightly. Some signs that deer are visiting your property include clipped leaves and hoof prints in the soil around the plants. 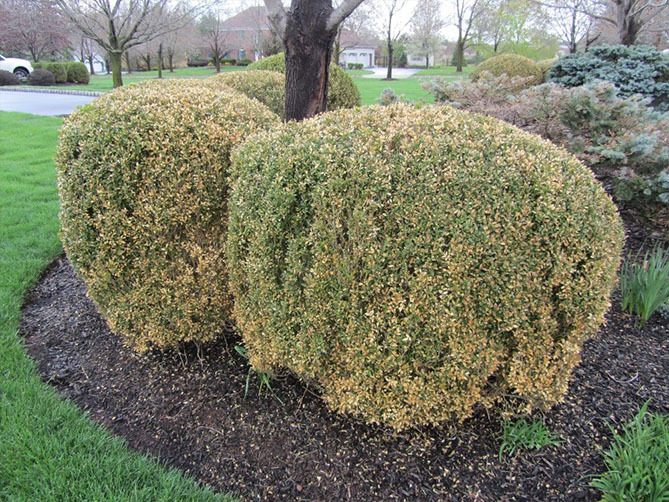 Deer damage on an arborvitae for instance is very noticeable, as the plant will have a healthy looking top while the bottom areas that deer can reach will be completely bare. Azalea plants produce beautiful flowers each spring if left undamaged during the winter months. Unfortunately, deer like to feed on the foliage and flower buds during the winter, leaving the home owner with fewer flowers and a lot less foliage. A holly plant, like the arborvitae, will look bare on the bottom and fuller on the top. When a plant is damaged, its ability to take up nutrients and distribute them becomes hindered. This type of damage may take years to recover and only if something is done to deter the deer from feeding on the same plant. Deer damage can also affect the value of your landscape. If you are not willing to wait years for your plants to recover, after using effective deer deterrents, the only option is to remove and replace. That can be costly, therefore our advice is to prevent deer damage immediately after you install landscape plants. Below, we will go over the best practices to keep deer away from landscapes. There are deer deterrent products on the market that can help keep deer away. Motion activated sprinklers are one available option that can help deter deer. When deer, or other animals walk by the sensor, it activates the sprinkler and sprays water in the direction of the movement. The sprinklers work best during warm months and cannot be used when temperatures are below freezing. There also sound and light deterrents that are activated with motion sensors as well. Physical barriers will also help keep deer away. During the winter, consider wrapping susceptible plants in burlap to help minimize damage. Chicken wire can also be an effective way to protect plants from hungry deer. Finally, deer fencing is also an option but needs to be tall enough to keep deer from jumping over. Another cultural option is to use deer resistant plants. That being said, if the deer are hungry enough, especially during tough winter months, they will feed on them as well. There are many sprays available on the market such as Bobbex, Liquid Fence, and Repels All. Most of these sprays are all natural and can be made of many different things that can deter deer (typically eggs, pepper, garlic). These sprays go right onto the foliage of the plants. Most sprays only last a week or two and require multiple treatments. Rain and sunlight will also break down these sprays faster. We use a product called Deer Off in our repellent program to keep deer away from landscapes. The main ingredients are Putrescent Whole Egg Solids (rotten eggs), Capsaicin and related Capsaicinoids (hot pepper extract), garlic and other ingredients. This product is reminiscent to the smell and look of hot sauce. The Deer Off product will last about a month on the plant material which is why our deer repellent program offers monthly treatments to help minimize damage. All these methods are just tools in your arsenal they are meant to help reduce feeding and to help keep deer away from your valuable landscape. 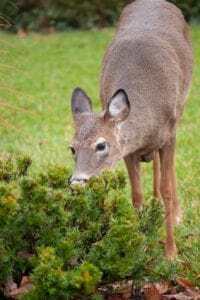 Unfortunately, there is no guarantee that the above practices will eliminate the deer from feeding on your landscape plants, but they will certainly help reduce the damage. New Jersey has a lot of deer, especially in our area. Protecting your plants can be a difficult task, even with all of the available options. If you live in our service area and have problems keeping deer away from your plants, feel free to give us a call at 908-281-7888 for a free estimate. All lawn care companies are not created equal. When comparing lawn care companies, it is important to take a deep dive at what you are paying for because various companies do not provide the same services. Below we outline important aspects of a lawn program, hopefully making it a bit easier for what to look for when hiring a new company. An important piece to the puzzle; prices! The first thing a company should do is measure your property, and it is important to remember that large price discrepancies in lawn care prices can be caused by mismeasurement of the property. Also, we recommend looking at the different treatments within each application, differences in treatments may cause price discrepancies. Another reason lawn care prices may differ is quality and quantity of the product being used. Whatever the reason you should always take a close look at what you are getting in each program when comparing lawn care companies, not just the number of times a company visits your property. Sometimes lawn care prices are the main selling point for people, and that is okay. If you are on a budget, a good lawn care company can help customize their programs to meet your specific lawn care and budget needs. However, you may lose out on some of the benefits of being a full program customer. Taking a closer look at services provided in each company’s program is essential when comparing lawn care companies. While the programs may look similar, the services within those programs can differ greatly. Starting from the beginning, most companies offer six to seven applications within a program with treatments six to eight weeks apart. In the next few sections we will breakdown the main differences between services throughout the year. There are usually two spring applications; an early spring and late spring. One company’s early spring application may include fertilizer, weed control and crabgrass pre-emergent. Another company may only offer fertilizer and weed control in the spring and consider the crabgrass pre-emergent an additional service or a separate application all together. Therefore, it is important to understand what each application includes when comparing lawn care companies. While discussing the spring applications, crabgrass pre-emergent is important to talk about. It can be applied one time in the spring or split into two applications. Studies have shown that splitting the pre-emergent applications have better results because the second application helps to extend the effectiveness of the crabgrass preventer in the soil for the season. When comparing lawn care companies, every company offers weed control; however, sometimes the weed control is included in the program while other programs consider it an additional charge service. In the summer, the most common treatments are fertilizer, grub control and surface feeding insecticide. When comparing lawn care companies, a lot of differences between programs typically occurs in the summer applications. Does the summer application have grub control or is that something that is purchased a la carte? Grubs cause substantial damage to lawns in our area annually and it is much cheaper to prevent them than repair damage caused by them. In addition, the summer is when numerous surface feeding insects like chinch bugs, bill bugs, and sod webworms cause damage to lawns. A program that includes surface feeding insecticides is beneficial to your lawn to prevent damage. For more information about these common summer time insects, check out our blog. In our New Jersey area, nutsedge is problematic weed during the summer. Make sure you ask your lawn care provider if nutsedge treatment is included in your program. Otherwise, you may have to pay extra to get it under control, or potentially hire a different company if it’s not an available option with your company. Early fall is another time of year where fertilizer and weed control is important. Some companies separate these two components into two applications, while others perform them as one. The late fall fertilization is one of the most important applications of the season because it helps with root development over the winter and aids with green up of your lawn in the spring. If you are comparing lawn care companies, it is important to notice if winterizing fertilizer is included in the program because some companies offer lime instead of the fertilizer for the last application. We can now look at the Gold Lawn Care program from Fairway Green Inc and discuss what is included in each application. In addition to the applications below, all Gold program customers receive free nutsedge control and service calls if problems arise throughout the season. 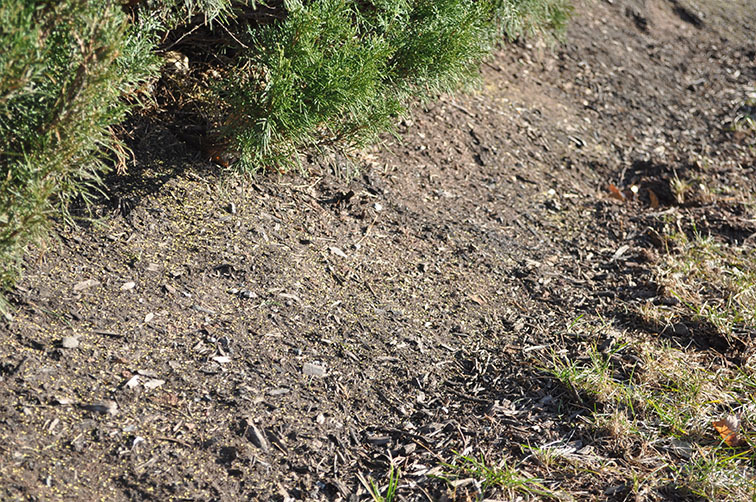 Early Spring – This application includes a fertilizer and crabgrass preventer for the lawn. As necessary, we apply broadleaf weed control. Late Spring – This application includes a fertilizer and a second crabgrass preventer depending on site, weather conditions and products used. As necessary, we also treat for surface feeding insects and broadleaf weeds. Any customer that receives the early spring and late spring applications get a crabgrass guarantee for the entire season. If any crabgrass does emerge in your turf, we come and treat it at no charge. Grub Control – This is a preventative treatment for grubs, which are the sub-surface feeding stage of beetles. They cause substantial damage to lawns in our area annually. With this treatment, you receive a guarantee against grubs for the season. Summer – This application includes fertilizer for the lawn and, as necessary, treat for surface insects and broadleaf weeds. Early Fall – This application includes fertilizer for the lawn and, as necessary, treat for surface feeding insects and broadleaf weeds. Late Fall – Our last fertilizing application for the lawn promotes winter hardiness and spring green-up. For more information about our lawn care programs, check out our frequently asked questions. Now you have the tools to help find your way out of the maze that is comparing lawn care companies. We urge that everyone takes a closer look at the various estimates you may receive to understand what you are paying for. If you are interested in learning more about Fairway Greens lawn programs, please give our office a call at 908-281-7888, or request a free estimate and complimentary lawn evaluation. It seems every year in this age of “climate change” there is some notable shift in the weather. Along with each of these changes comes new challenges to the lawn care provider. The challenge this year came in the form of precipitation. From the very snowy March to the tremendously wet late summer, this year was anything but conventional for turf managers. Snow cover in March delayed the start of the active growth of the turf. This means that broadleaf weeds, and undesirable grass species that thrive in wet/cold soil conditions have an opportunity to grow without much competition. Once the snow melts away there are often very thin to bare areas where grass plants have shrunk in the overly saturated, cold conditions, and yet weeds such as hairy bittercress, chickweed and wild onion have persisted. 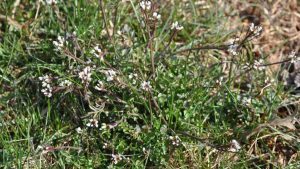 While these are not difficult weeds to control, they remain on the lawn until there is enough snow melt for the initial treatment to be applied. Anytime the weather promotes weed growth, and prohibits lawn applications…it’s a problem. Often, full-service programs can create the illusion that broadleaf weeds are prevented, but the truth is that we are only able to control what is actively growing on the lawn when we are present. So, if you feel as though you saw more weeds at the start of the season than normal, that may have been true depending on the timing of your first treatment. Hairy bittercress is a common early spring broadleaf weed. The extended wetter/cooler period also promoted the growth of rough bluegrass (poa trivialis) and annual bluegrass (poa annua). These two grass species thrive under wet/cool conditions. They both have a much lighter green color which makes them stand out among the other turf types. While this attribute is bothersome enough for most homeowners, both species also stop producing growth once the weather becomes warmer and drier causing dead patches to appear. To top it all off, neither grass is controllable with any normal treatment program offered by lawn care services. While these grasses may sound horrific, keep in mind they aren’t generally a noticeable issue (in the absence of a drainage issue or improper watering) unless we are experiencing very cool/wet weather for extensive periods. Image on the left shows annual blue grass or poa annua. Image on the right shows rough blue grass or poa trivialis. Snow lasting well into March is never good, but its occurrence is not that uncommon for the northeast; however, the amount of rain that fell at the start of September this year was without precedent, and the ensuing disease outbreak it triggered was epic. Generally, in September the active disease period subsides, and lawns start to recover from the stressful summer. The warm days and cool nights during this time are perfect conditions for promoting grass growth and discouraging any sort of major disease activity. This year, what the weather brought instead was frequent, heavy rainfall with very humid nights. This overly saturated, moist-air environment is absolutely perfect for promoting fungal activity. Pythium blight and grey leaf spot in particular were incredibly prominent. Lawns observed in the morning dew (which lasted until almost noon some days) were covered with mycelium that resembled cobwebs to cotton-ball like or both. Seeing the physical presence of these fungi evident on a handful of lawns for the year is not uncommon. Seeing lawns covered in this type of growth on nearly every lawn, every morning, of every day… just doesn’t happen. The cure for such disease activity is to allow the lawn time to dry out, and to core aerate. The presence of oxygen in the soil pores keeps the disease from being able to actively spread. 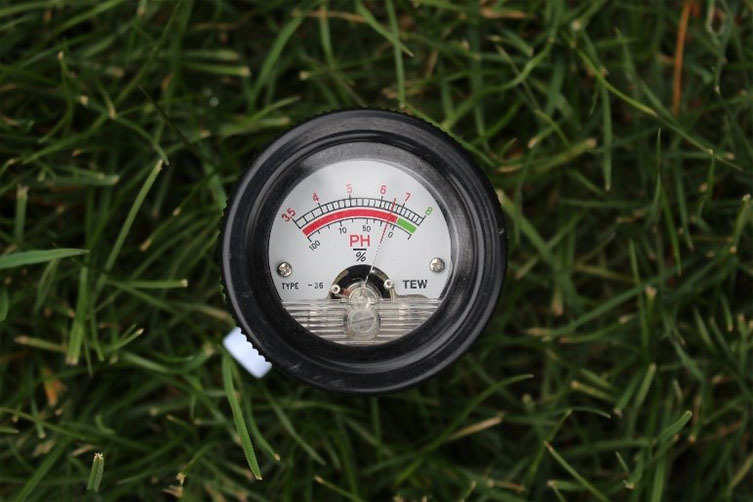 Usually allowing enough time for water movement between irrigation cycles and further oxygenating the soil through core aeration, is more than enough to promote turf growth and reduce disease activity. The problem was that the rain was so frequent, and the air was so humid, that the lawns were never able to dry out. With conditions remaining favorable for so long, lawn disease activity was rampant, and damage to the turf was wide-spread. Image on the left shows a lawn with grey leaf spot. Image on the right shows a lawn with pythium blight. Shouldn’t a “full service” program include applications that prevent such things from happening? The answer to this question is yes and no. Yes, there is treatment for disease that exists in the form of fungicides. Applications of fungicides can be done periodically before disease outbreaks occur to prevent them from happening, or to help suppress activity once your lawn is already affected. No, they are not included in full service programs automatically. Why not? The answer is simple, cost. Fungicides are expensive, and on top of that they are only effective for a few weeks at a time, so applications need to be done frequently to prevent disease. Preventative disease programs are offered by lawn care service providers but are usually only recommended to customers facing the same disease issue year after year. The benefit of a fungicide application is only realized if the disease is treated prior to it laying waste to the large areas. Asking someone to spend additional money on an application that won’t make the lawn look any better just isn’t practical. The best recommendation in this scenario was to spend the money on dealing with the disease culturally through core aeration, seeding, or a combination of the two. After all, a fungicide will only address the disease activity. Core aeration not only helps quell the fungus activity, but also promotes turf recovery, so its benefit is two-fold. So how does one keep this from happening ever again? In truth, there is no way to fully prevent this kind of outbreak from occurring. The best way to stay proactive is with good cultural practices. Core aerate the lawn at least every other year, avoid watering the lawn too frequently (no more than twice each week), and seed the lawn with newer disease resistant varieties. At the end of the day though, it is important to realize that lawns are a lot like us. No matter how healthy they are, they can still become sick. In addition to disease, the excess moisture in the soil also meant a lot more weed growth than normal. Warm-season weed growth is usually kept in check by lower soil moisture, exploded at summer’s end with the arrival of all the rain. Crabgrass and Nutsedge growth were both noticeably worse. Crabgrass prevention is part of any basic service program and gets put down in the spring prior to its emergence in early summer. These preventative applications form a barrier that controls crabgrass plants as they attempt to breach the soil surface. The barrier typically lasts long enough to keep crabgrass under control into July. When August arrives the control has worn off, but by then it is so dry that any new growth is very minimal. This year however, there was more than enough soil moisture to promote the crabgrass growth once the barrier wore off. Nutsedge is a warm-season perennial that is always an issue for lawn care providers each summer. Like crabgrass, it starts becoming noticeable sometime in June, but the difference is that there is no preventative treatment for this nuisance. Plants can only be controlled as they appear in the lawn. Nutsedge is a marsh-grass by nature and prefers areas that stay consistently moist, and so typically it is only a larger problem on irrigated properties or properties with poor drainage. However, with the rain this year, every lawn was consistently saturated. 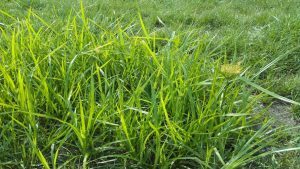 Homeowners that don’t usually have to worry about controlling this weed saw growth of nutsedge soar out of control on their properties. And while a few companies include treatment of this weed on full-service programs, most only offer control at an additional charge due to the high cost of nutsedge control products. This picture shows the color and height difference between the weed nutsedge and preferred grass varieties. While some maintenance programs may have underperformed this year in the eyes of a lot of homeowners, it is important to keep in perspective just how out of the ordinary this year was. If the lawn treatment program in place has been successful in years prior to this, then making adjustments to the annual regimen to allow for this type of weather pattern would be foolish. The best lawn care providers enact programs that are designed to function at a high level within the climate and rainfall that is typical. And when these programs underperform due to changes in the weather, the good companies know the best thing they can do is take the time to communicate to their clients’ what adjustments in the service plan may be needed for that year. If you have any questions regarding your lawn care service, or would like to receive a free estimate, please give our office a call at 908-281-7888.